Pickup from Cochin Airport at 16:55 pm . Proceed For Alleppey approx. 60 Kms, the backwater region of Kerala. Upon arrival check in to your Houseboat. Rest in the eveing is free to relax. Overnight stay in Houseboat.Alleppey: With the Arabian Sea in the west and a vast network of Lakes, Lagoons and freshwater rivers criss-crossing it, Alappuzha is a district immense natural beauty. Referred to as the Venice of east by travelers from across the world. This backwater country is home to diverse animal and bird life. By virtue of its proximity to the sea, the town has always enjoy a unique place in the maritime history of Kerala. Today, Alappuzha is an important backwater destination attracting several thousand foreign tourists every year. 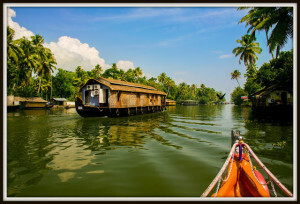 Alappuzha is also famous for its boat races, beaches, marine products and coir industry. A singularity of this land is the region called “KUTTANAD” – a land of lush paddy fields referred to as the rice bowl of Kerala and one of the few places in the world where farming is done below sea level. Sightseeing Places of Alleppey : Vembanad Lake, Alleppey Beach. Today proceed to Thekkady (Periyar) approx. 137 Kms known for its lush forest. On arrival, check-in at your hotel. In the evening enjoy spice shopping at Kumily village. Overnight stay in Thekkady. Today proceed to Periyar wildlife Reserve. In Periyar you could spot a family of Elephants, Wild Boar or Sambar Deer by the water’s edge. Proceed for the green hills of Munnar. approx. 110 kms. On arrival check in at the hotel. Evening town visit. Overnight at the hotel. Today proceed for a local sightseeing, visit the beautiful Mattupetty lake and Dam, Kundla Dam, Echo Point and Top Station to enjoy the scenery. Evening is free for shopping. Overnight stay in Munnar.Optional: Visit to Kullukumalai Tea Factory can be arranged by a local Jeep at an additional cost of Rs.2,250 per jeep with capacity of 5 persons in total. Entrance per person will be charged Rs. 100/- which client has to pay at the time of entering factory. 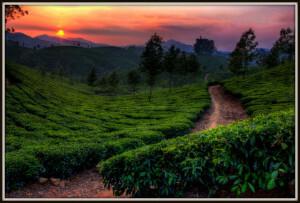 Today proceed for a Munnar local sightseeing,Evening at your leisure. overnight at hotel. Leave for Kochin approx – 110 Kms/ 4 Hrs. Sightseeing in Kochin & Drop at Kochin Airport for onwards journey.